Vehicle Serves as a Benefit in Emergency Response Situations Enabling the Transport of Over Two Dozen Evacuees/Personnel. Yaphank, NY - August 8th, 2013 - County Executive Bellone and FRES Commissioner Joe Williams were joined by fire rescue and emergency personnel to highlight Suffolk County’s new Major Response Emergency Vehicle (MERV). The MERV is designed to provide mass casualty incident response and transport, medical evacuations, on-site triage, firefighter and EMS rehabilitation and medical support for long term emergency incidents. The 42 foot unit comes equipped with stretchers to accommodate 24 patients and medical personnel for transport, patient monitoring equipment, metered oxygen, electrical capacity to supply power for necessary medical equipment, rehab supplies, and all in a climate controlled area. The unit can be deployed to neighboring municipalities throughout New York state in an event of an emergency and was designed using radio frequencies which can communicate universally thereby ensuring communication with various emergency personnel and departments. "This bus will be a huge resource across the region when it comes to providing emergency services," said Commissioner Williams. "It can be activated during evacuations, bus, train or ferry accidents, and, weather related emergencies when there is a need to treat people at the scene or transport them to hospitals." Suffolk County was part of the original design team to ensure the appropriate capabilities and functionality of the emergency vehicle. The MERV was designed to serve in a variety of emergency situations maximizing its usage and efficiency. In addition to providing medical evacuations, the MERV also provides: safe areas of refuge for firefighters, EMS responders, hazmat responders and others responding to large scale fires, and support of the County’s Urban Search & Rescue Team and Decontamination Strike Team operations. "This could not have been made possible without the hard work and efforts of numerous agencies," Robert Delagi Director EMS and Public Health Emergency Preparedness. "The service will be available not only throughout Suffolk County but the entire state, making this another prime example of shared services as a cost efficient strategy." The cost for the unit was $380,000 and purchased through a federal grant provided by the Department of Homeland Security to Suffolk County Fire Rescue and Emergency Services. 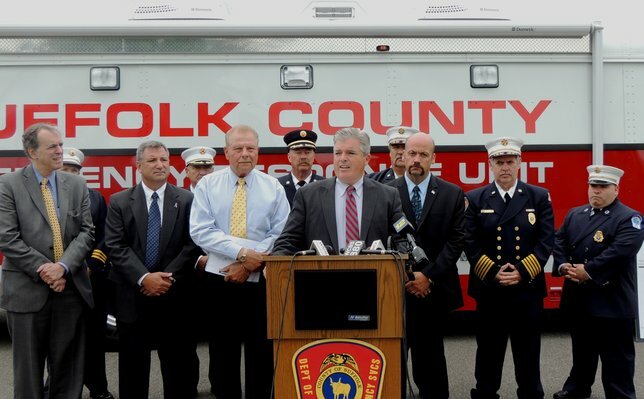 “These funds have been put to great use in providing Suffolk County Emergency Responders a vehicle which will assist them during large scale emergency events,” stated County Executive Bellone. Photo Courtesy of Suffolk County. Subject: LongIsland.com - Your Name sent you Article details of "Bellone, FRES and EMS Showcase Suffolk County’s New Major Emergency Response Vehicle"